The hydrographic surveying community is using high-accuracy Global Navigation Satellite System (GNSS) positioning techniques for vertical positioning of survey platforms, the sea surface and the sea floor. 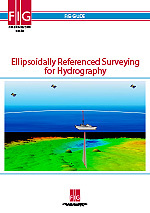 This method of hydrographic surveying is known as Ellipsoidally Referenced Surveying (ERS). ERS provides a direct measurement of the sea floor to the ellipsoid, as established by GNSS observations, and a translation of the reference from the ellipsoid to the geoid and/or a chart datum. In order to meet required vertical positioning standards, it is of paramount importance that the entire ERS process be thoroughly understood and that the appropriate procedures are in place during data acquisition, validation, cleaning and processing phases. Many of the groups using ERS techniques have developed their internal Standard Operating Procedures (SOP) through in-house experience and trial-and-error testing. It is this wealth of group information that is being drawn upon to help develop a set of “best practices” for the hydrographic industry. The development of ERS best practices is being conducted by International Federation of Surveyors (FIG) working group 4.1 under Commission 4 and will be shared with the IHO for possible inclusion in International Hydrographic Organization (IHO) publication C13, Manual on Hydrography. I would like to thank our working group chair, Mr. Jerry Mills, for leading this work and the working group technical lead, Dr. David Dodd, who was solely responsible for communicating with the various contributing organizations, collating their comments and developing the majority of the manuscript. This is a significant contribution of these geomatics professionals to the wider objectives of the international hydrography community, and as well to those of the FIG. This document has been developed from contributions from many hydrographic organizations around the world and aims to provide a background that can be utilized by hydrographers to establish best practices for ERS. It looks at the relative importance of all of the vertical components associated with ERS, including; GNSS-based positioning of the antenna, translation of antenna position to the survey platform reference point per rigid body motion, and the application of heave and dynamic draft. Also discussed is the development of vertical-datum separation models used to translate the ERS information to other datums, such as a geoid and a chart datum. Ten case studies are included to provide examples of how different groups are using ERS. The final chapter of the document provides a summary of the recommended best practices that the hydrographic surveying community use for success in ERS work. Special thanks are given to CARIS, the University of New Brunswick (Ocean Mapping Group) and the University of Southern Mississippi (Hydrographic Science Research Center) in recognition of their financial support.